Hi, we are the Vallis family and we run Highdown farm, A Duchy of Cornwall farm on Prince Charles Bradninch Estate. “Highdown and the Bradninch estate has always been in the Duchy of Cornwall since the Duchy was created in 1337 for the Black Prince”. 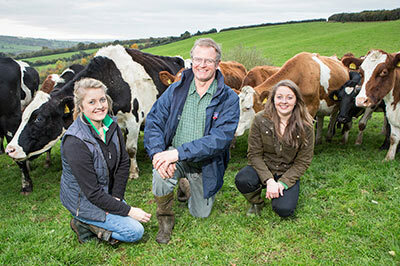 The Farm is run by Graham and Sandra alongside daughters Laura and Emily. We took Highdown in 1991 after farming a Starter farm for 6 years. We started Organic conversion in 1996 when the children were young. The farm is now 400 acres growing mostly grass but also cereals and kale for the cattle. We started in the kingdom pool in summer 2015. Laura milks the 180 mixed bred cows on a spring Paddock system with most of the milk coming from grazed grass and grazed forages. The cows are housed if the weather is bad but the farm is dry and south facing so are out most of the time. Emily looks after the calves and the young stock . She also does most of the tractor work and feeds the cows in the winter. Sandra does the book keeping alongside running 3 holiday cottages. Graham just helps every one! Becca our eldest and her Husband are vets so are called on for advice.